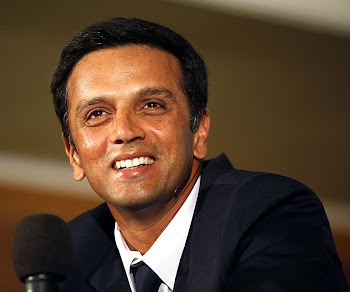 Rahul Dravid: The Wall is back! At last the long....long wait is over.Every fan of Rahul must have had a good day with smile on the face.All of us have been supporting him inspite of his failures, still believing his abilities to score tons of runs and still watching his innings with all eyes set on the number after the name Dravid. Last week, while watching some xyz news channel, I saw a former cricketer asking the selectors to 'throw' Rahul out of the team.I just could not bare those words and I even could not imagine how Rahul would have felt if he had watched it.There were a lots of things being said about him, but he was quiet.Not a single word spoken, not a single word written in any newspaper column during this period, he knew that all he needed was to answer with his bat. As usual, there were quite a few comments against him.He was now being criticised for taking the match towards a tame draw. On day 2, Rahul started to silent his critics with his bat.He went past 90 within very short time duration.It was then that the whole Rahul fan community held their breaths.Flintoff started teasing him keeping the deliveries outside the Off stump.But, the wait was over when he whipped away the ball on pads to get his 26th hundred. His reaction unfolded his mind.He did not jump, no punching in air, no over reacting- he just completed the run with a simple jog down the pitch.The dressing room went up to congratulate him.They knew that the Wall is back!